If you recently bought a new coffee pot, it may take some time until it will produce good coffee. It takes some experimentation to find just the right amount of coffee to suit your taste. If you are serving real coffee connoisseurs, don't reheat coffee, as reheated coffee has inferior flavour. If you cannot read coffee-grounds to tell someone's future, you may use them to rejuvenate your plants. An acceptable alternative for the busy person. Ground coffee is an excellent compromise between using fresh coffee beans and instant coffee. Ground coffee oxidizes in 12 hours at room temperature in an open container so proper storage is mandatory. We believe one must be in a great hurry not to enjoy the real thing! Packaging and storing are two very important steps to preserve coffee flavour and aroma. Coffee (whole or ground) is very sensitive to humidity and should therefore be kept in sealed containers, preferably frozen. Invented by Italians in the 19th century, the Expresso machine undeniably extracts the most flavour out of any coffee. It is a real wonder of technology; yet as with many exceptional inventions, methods of utilization are sometimes complicated. Due to the very high water pressure, we recommend the use of finely ground coffee beans. 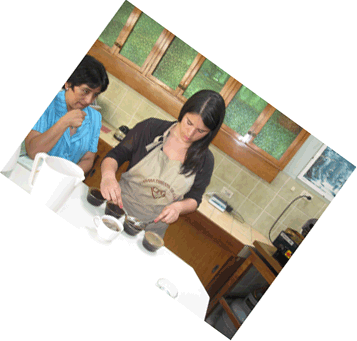 Commonly used in North America, filtered coffee id probably the easiest to prepare. Filtered coffee maker will normally allow one to produce from two to twelve cups of coffee at a time. Medium-ground coffee is placed in a conical or flat filter (preferably a paper filter) allowing the coffee to gradually drain drop by drop. We recommend not letting the coffee sit a long time so as not to lose its flavour. Furthermore, brewing regular coffee in the same filtered coffee maker as flavoured coffees (vanilla or hazelnut coffees) is not recommended. The plunger pot normally consist of a glass jar and a metallic filter on a plunger. One presses the plunger filter to the bottom of the jar a few minutes after adding boiling water and a coarsely ground coffee. this coffee pot which uses the old-fashioned way of preparing Turkish and Greek coffee can be found in Middle Eastern or Greek grocery stores. Usually, connoiseurs taste their coffee in very small cups which they never completely empty in order to avoid consuming the thick coffee-grounds. to prepare this coffee it is recommended to bing to a boil two cups of cold water with two soupspoons of very finely ground coffee and two soupspoons of sugar as well as two cardamom seeds; then let it stand for a few minutes. Repeat twice and add a few drops of cold water before drinking.